I started homeschooling in 1994. At the time there were no homeschooling blogs, very few curriculum choices, and not very many people to talk with about homeschooling questions. I remember one gathering of homeschool moms that I went to. We sat in Linda’s living room and just talked about homeschooling. Some moms had been doing it for a while, and they provided tips. In the midst of their tips there were about 71.3 kids running around, and no one was an expert. We all had very real, very noisy kids. And when I went home, I felt like I had the same joys and struggles as the rest of the moms. Fast forward twenty years, and I’m right here again. I have three little ones again, and I’m looking forward to digging into full-time homeschooling next year. I have to admit it’s easy to get overwhelmed. There is so much curriculum. There are so many blogs, pins, experts, and ideas. 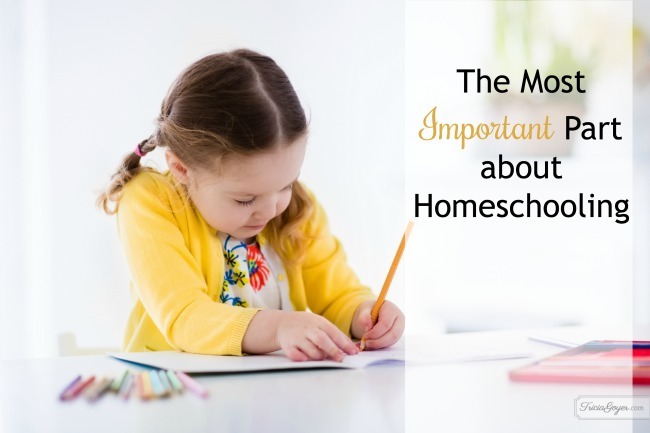 There is an instant connect with other homeschooling moms that I didn’t have the first time around. I can private message, tweet, or text dozens of homeschool moms at a moment’s notice. I can look on Facebook and see just what they’re doing. And then come the worries about comparing and keeping up. After twenty years, homeschooling has gained popularity. There are tons more resources, but at the end day it comes down to one thing: you, your child/children, and passing on a love for learning. It’s sitting side-by-side on the couch reading Bible stories. It’s counting M & Ms. It’s going on walks and kicking up fall leaves or finding animal tracks in the snow. Whether you’re part of a homeschool co-op or not. Whether you have a group of women to gather with or not. Whether you pick this curriculum or that–or not, that’s not what homeschooling is about. Whenever you get overwhelmed it’s time to ignore the pins, turn off the blogs for a time, and stop those texts. Instead, flip through the books, find something fun, and focus on your kids. Make learning fun, find the most interesting facts, and usher your child into a part of the world he’s never experienced before. The most important part of homeschooling isn’t what everyone else is doing … it’s that moment when you peer into your child’s lives, see the joy of learning, and cherish the moment that God gave you. Times have changed but one thing hasn’t … those moments with you and your child are the memories that will last more then twenty-five years. They’ll last a lifetime. My friend, Sherry Kyle, mentioned you the other day as we conversed about following God in our writing rather than what everyone else thinks we should be doing. Sherry commented that you are someone who has written many different genres following God’s ways. (We’ve both been struggling with wanting to write what God puts on our hearts rather than branding ourselves with only one particular genre.) Then, here I stumble upon your article in Sonoma Christian Home and in searching your blog find your story is amazing. And you homeschool. You have no way of knowing how encouraging that is to me as I homeschool my second-batch-of-children daughter and write. (But I’m pretty sure I’m way older : -). Anyway, just wanted to say thank you. You’ve inspired me. You’re welcome, Laura! I love how God uses us to encourage each other.